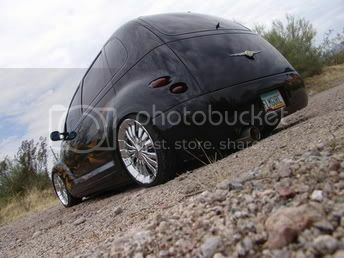 Anyone know the type of GRILL and GROUND EFFECTS (body kit) are on the silver and the black/orange PT's that are featured with the "PTCruiserLinks.com Girls Girls Girls!" photo's? If so, I'd also like to know where to purchase both. Any help is appreciated. So what you are saying is either we have to make it or modify the normal horizontal alum. grill because I've been wondering where to find those sucker's myself and assumed possibly a custom job myself. That is something I was thinking of is has anyone tried or checked into either making or having one made? I was considering it myself anyway's, thinking $100.00 for materials as a rough est. When I have time I'll work on a rough templet and see what I come up with, custom would be better for points at shows not that I'm one to want the embarissment of being side by side with some of your guy's masterpeices. Maybe I can make her a deal for hers!